and ended with a funeral. 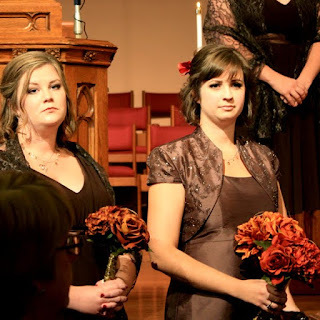 Last Saturday, one of my best friends, Kim, married fine Dutch-American lad named Caleb, and I was a bridesmaid. 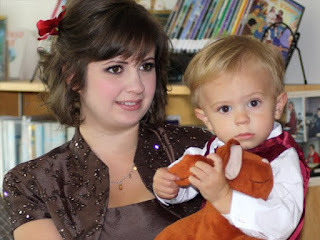 Ethan was the somewhat reluctant ring bearer. We had to bring Bunny as his pre-wedding wingman. We had a wonderful, whirlwind weekend—possibly our last trip to the house where I would soak in a hot bath every day after a bone-chilling winter walk home from school, where I experienced my first white Christmas, a house that still feels like home. I didn't focus on that part, though. I just enjoyed our time there, celebrating with Kim and Caleb and so many other friends who feel like family. 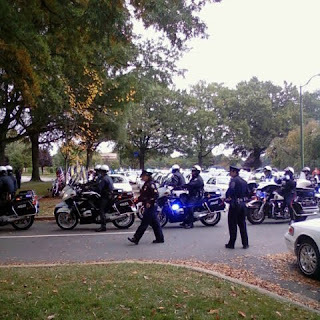 As you all know, we lost an officer earlier this week, and his funeral was on Friday. Literally hundreds upon hundreds of people showed up, including LEOs from around the state, who lined the Hearn Plaza at Wake Forest University as a horse-drawn caisson brought Sergeant Hutchens to Wait Chapel. It's hard to tell from this photo how many officers were actually there, but to give you a better idea, it took nearly 30 minutes for all of them to be escorted in and be seated after the coffin was delivered to the front of the chapel. I have to admit, this tragedy didn't sink in with me until I saw the flag-covered casket as it was slowly brought down the center aisle. For the previous few days, I had been perhaps mercifully caught up in a flurry of phone calls and emails for my duties as Sergeant of the Bereavement Committee for Behind the Blue Line. Although I was enmeshed in our response as a group, I didn't have time to think, to process, for myself. But as the coffin passed just a few feet away, followed by the devastated family and the shell-shocked squad—which included our dear friend and Noah's academy classmate Brian, husband of Ethan's babysitter, Heather—I couldn't help but do what we all try not to: I thought, This could have been us. I picked Noah out of the mass of blue uniforms; he was just a few rows behind me, in the next group of pews. It was easy to imagine him being gone, alone though surrounded by friends as I was. It was easy to imagine any number of scenarios that would have put him in that parking lot, one that he used to sit in nearly every single morning before getting transferred. It could have been Brian. The shooting happened in Brian's beat, and both officers who were shot were in Brian's squad. It just so happened that Brian had been assigned to work the fair that week, so he wasn't with his squad as he has been countless other mornings. Maybe the worst part is, we all know something like this will happen again. It's only a matter of when, and to whom. I also took a video of the motorcade, but I stopped recording after more than six minutes. Noah isn't supposed to show displays of affection while in uniform, but exceptions were made on Friday. I leaned back against his vested chest and looked at him, in dress uniform, and I felt lucky. Yesterday Ethan, Noah and I went with Brian, Heather and their son Caleb to do the American Heart Association Start! Walk.We walked alongside our friends Chad and Amber, another LEO family we met during Academy, in honor of their son, Jacob. Jacob passed away four months after being born with a heart defect, a month before Ethan was born. I had sat next to Amber at Sergeant Hutchens's funeral, and I realized that the last funeral I attended was Jacob's. We have seen a lot of tragedy since joining the police, but we've also forged some strong friendships. Friends who feel like family. It was good to be back. I've been a part of too many of those motorcades. You wrote, "Maybe the worst part is, we all know something like this will happen again. It's only a matter of when, and to whom." That is a rare week. Rare and amazing, to be part of these life changing moments, both happy and sad. These are amazing photo's! What a tribute to a fine officer who gave the ultimate sacrifice....Thoughts and prayers to the family. There just aren't words for these times in our lives but I'm so glad this passing was marked in a meaningful way. And I'm glad the funeral gave you--and all those touched by this death--a chance to process some of the emotions it brought up. First, you looked beautiful at that wedding. Thank you for sharing the pictures. How is the other officer doing? Ah, Erin, so much to take in, and so well written. May I say, besides all the heavy important stuff, that little man of yours is dashing? Christopher—Although the probability of tragedy is always there, being part of the police family is a source of pride, isn't it? Maggie May—I'm so grateful that I have the support system I do, so I truly am able to appreciate being part of these moments instead of being overwhelmed by them. 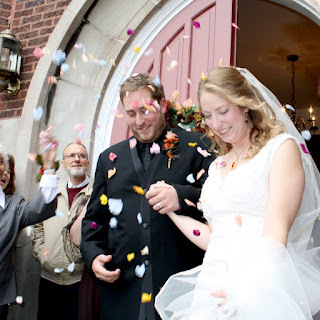 MrsOfficer—The Wake Forest campus is truly stunning, and the church Kim was married in was absolutely gorgeous. Something about both settings really added to the poignancy of those moments. May—It really is a strange mix of feelings, sorrow and pride. But as the pastor giving the eulogy said, there is also hope. Damsel Underdressed—Thank you! The other officer is doing well as far as I know, at least physically. Although he did tell friends that being tazed is worse than being shot :) I haven't been in contact with his family (our Support Committee is doing that). Lisa—You most certainly may say that. 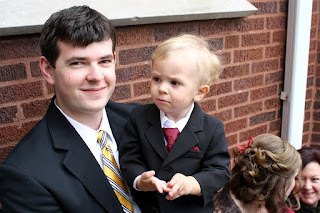 I can't wait to see the professional photos of the ceremony, just to see more of that kid in a suit. What a week. The wedding looked beautiful and the funeral very honorable to a man that deserves honor. I can't imagine how I'd feel if I were you, sitting in that pew. more and more I long to live somewhere where I can see scenery like that! My condolences to all of the officers - in a perfect world, this would never happen, but we all know that just is not the case. God bless you, your husband, and all those who put themselves on the line for the rest of us. You look so gorgeous at the wedding Erin. I love your big brown eyes. I'm so sorry for the loss of your friend. That is just heartbreaking.